Black-light sessions in late August and early September by Greg Courtney's Systematic Entomology class along the South Skunk River resulted in collection of several adult spongillaflies (Sisyridae: Climacia areolaris). 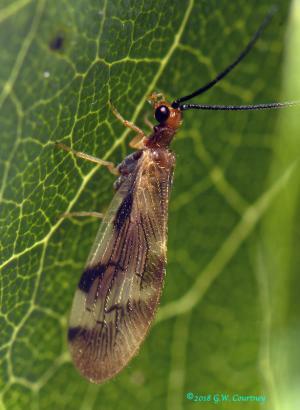 These presumedly “rare” insects had never been recorded from central Iowa (in fact, they were previously known only from extreme NE Iowa). Spongillaflies are unusual in that the larvae are obligate inhabitants of freshwater sponges, where they use highly specialized mouthparts to pierce and feed on individual cells of the sponge.